"fish (fry)" redirects here. For the food product consisting of fried fish, see fish fry. Juvenile fish go through various stages between birth and adulthood. They start as eggs which hatch into larvae. The larvae are not able to feed themselves, and carry a yolk-sac which provides their nutrition. 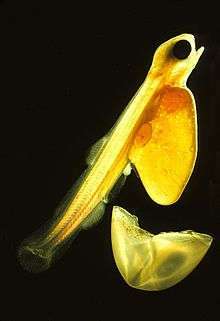 Before the yolk-sac completely disappears, the tiny fish must become capable of feeding themselves. When they have developed to the point where they are capable of feeding themselves, the fish are called fry. When, in addition, they have developed scales and working fins, the transition to a juvenile fish is complete and it is called a fingerling. Fingerlings are typically about the size of fingers. The juvenile stage lasts until the fish is fully grown, sexually mature and interacting with other adult fish. Ichthyoplankton (planktonic or drifting fish) are the eggs and larvae of fish. They are usually found in the sunlit zone of the water column, less than 200 metres deep, sometimes called the epipelagic or photic zone. Ichthyoplankton are planktonic, meaning they cannot swim effectively under their own power, but must drift with ocean currents. Fish eggs cannot swim at all, and are unambiguously planktonic. Early stage larvae swim poorly, but later stage larvae swim better and cease to be planktonic as they grow into juveniles. Fish larvae are part of the zooplankton that eat smaller plankton, while fish eggs carry their own food supply. Both eggs and larvae are themselves eaten by larger animals. Egg stage: Spawning to hatching. This stage is used instead of using an embryonic stage because there are aspects, such as those to do with the egg envelope, that are not just embryonic aspects. Larval stage: From hatching till all fin rays are present and the growth of fish scales has started (squamation). A key event is when the notochord associated with the tail fin on the ventral side of the spinal cord develops and becomes flexible. A transitional stage, the yolk-sac larval stage, lasts from hatching to the absorption of the yolk-sac. Juvenile stage: Starts when the transformation or metamorphosis from larva to juvenile is complete, that is, when the larva develops the features of a juvenile fish. These features are that all the fin rays are present and that scale growth is under way. The stage completes when the juvenile becomes adult, that is, when it becomes sexually mature or starts interacting with other adults. This article is about the juvenile stage. Fry – refers to a recently hatched fish that has reached the stage where its yolk-sac has almost disappeared and its swim bladder is operational to the point where the fish can actively feed for itself. Fingerling – refers to a fish that has reached the stage where the fins can be extended and where scales have started developing throughout the body. In this stage, the fish is typically about the size of a finger. Fry and fingerling are terms that can be applied to juvenile fish of most species. But some groups of fishes have juvenile development stages particular to the group. This section details the stages and the particular names used for juvenile salmon. 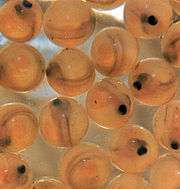 Sac fry or alevin – The life cycle of salmon begins and usually ends in the backwaters of streams and rivers. These are the salmon spawning grounds, where salmon eggs are deposited for safety in the gravel. The salmon spawning grounds are also the salmon nurseries, providing a more protected environment than the ocean usually offers. After 2 to 6 months the eggs hatch into tiny larvae called sac fry or alevin. The alevin have a sac containing the remainder of the yolk, and they stay hidden in the gravel for a few days while they feed on the yolk. 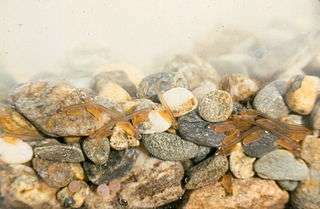 Fry – When the sac or yolk has almost gone the baby fish must find food for themselves, so they leave the protection of the gravel and start feeding on plankton. At this point the baby salmon are called fry. 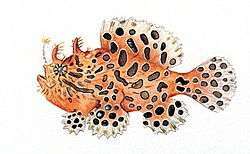 Parr – At the end of the summer the fry develop into juvenile fish called parr. Parr feed on small invertebrates and are camouflaged with a pattern of spots and vertical bars. They remain in this stage for up to three years. 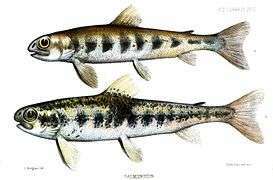 Smolt – As they approach the time when they are ready to migrate out to the sea, the parr lose their camouflage bars and undergo a process of physiological changes that allows them to survive a shift from freshwater to saltwater. At this point the salmon are called smolt. Smolt spend time in the brackish waters of the river estuary while their body chemistry adjusts (osmoregulation) to the higher salt levels they will encounter in the ocean. Smolt also grow the silvery scales which visually confuse ocean predators. Post-smolt – When they have matured sufficiently in late spring and are about 15 to 20 centimetres long, the smolt swim out of the rivers and into the sea. There they spend their first year as post-smolt. Post-smolt form schools with other post-smolt and set off to find deep-sea feeding grounds. They then spend up to four more years as adult ocean salmon while their full swimming and reproductive capacity develops. Salmon eggs. The growing larvae can be seen through the transparent egg envelope. The black spots are the eyes. Juvenile fish need protection from predators. Juvenile species, as with small species in general, can achieve some safety in numbers by schooling together. Juvenile coastal fish are drawn to turbid shallow waters and to mangrove structures, where they have better protection from predators. As the fish grow, their foraging ability increases and their vulnerability to predators decreases, and they tend to shift from mangroves to mudflats. In the open sea juvenile species often aggregate around floating objects such as jellyfish and Sargassum seaweed. This can significantly increase their survival rates. Juvenile fish are marketed as food. Whitebait is a marketing term for the fry of fish, typically between 25 and 50 millimetres long. Such juvenile fish often travel together in schools along the coast, and move into estuaries and sometimes up rivers where they can be easily caught with fine meshed fishing nets. Whitebaiting is the activity of catching whitebait. Whitebait are tender and edible, and can be regarded as a delicacy. The entire fish is eaten including head, fins and gut. Some species make better eating than others, and the particular species that are marketed as "whitebait" varies in different parts of the world. As whitebait consists of fry of many important food species (such as herring, sprat, sardines, mackerel, bass and many others) it is not an ecologicially viable foodstuff and in several countries strict controls on harvesting exist. Elvers are young eels. Traditionally, fishermen consumed elvers as a cheap dish, but environmental changes have reduced eel populations. 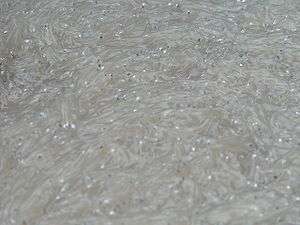 Similar to whitebait, they are now considered a delicacy and are priced at up to 1000 euro per kilogram. Spain has eel dishes, called "angulas", which are baby eels usually served sauteed in olive oil, garlic and a chili pepper. Elvers are now very expensive. A small serving of angulas can cost equivalent of $US100, and there are imitation angulas which can be purchased cheaply. ↑ What are Ichthyoplankton? Southwest Fisheries Science Center, NOAA. Modified 3 September 2007. Retrieved 22 July 2011. 1 2 Moser HG and Watson W (2006) "Ichthyoplankton" Pages 269–319. In: Allen LG, Pondella DJ and Horn MH, Ecology of marine fishes: California and adjacent waters University of California Press. ISBN 978-0-520-24653-9. ↑ Kendall Jr AW, Ahlstrom EH and Moser HG (1984) "Early life history stages of fishes and their characters" American Society of Ichthyologists and Herpetologists, Special publication 1: 11–22. 1 2 Guo Z, Xie Y, Zhang X, Wang Y, Zhang D and Sugiyama S (2008) Review of fishery information and data collection systems in China Page 38. FAO Fisheries and Aquaculture, Circular 1029. FAO, Rome. ISBN 978-92-5-105979-1. ↑ Boehlert GW and Mundy BC (1988) "Roles of behavioral and physical factors in larval and juvenile fish recruitment to estuarine nursery areas" American Fisheries Society Symposium, 3 (5): 1–67. ↑ Laegdsgaard P and Johnson C (2000) "Why do juvenile fish utilise mangrove habitats?" Journal of Experimental Marine Biology and Ecology, 257: 229–253. ↑ Hunter, JR and Mitchell CT (1966) "Association of fishes with flotsam in the offshore waters of Central America". US Fishery Bulletin, 66: 13-29. ↑ Kingsford MJ (1993) "Biotic and abiotic structure in the pelagic environment: Importance to small fishes" Bulletin of Marine Science, 53(2):393-415. ↑ Basque food: Angulas Retrieved 14 February 2012. Atlantic Salmon Trust Salmon Facts Retrieved 15 December 2011. 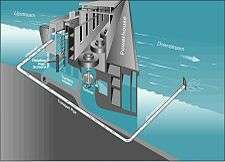 Bley, Patrick W and Moring, John R (1988) Freshwater and Ocean Survival of Atlantic Salmon and Steelhead: A Synopsis" US Fish and Wildlife Service. Lindberg, Dan-Erik (2011) Atlantic salmon (Salmo salar) migration behavior and preferences in smolts, spawners and kelts Introductory Research Essay, Swedish University of Agricultural Sciences.